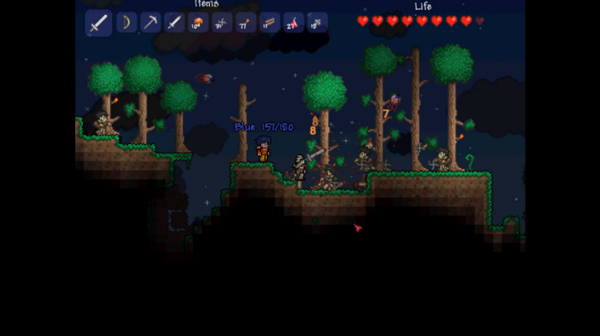 Terraria is, as many people might describe it, a 2D Minecraft. Some would argue that it’s nothing at all like Minecraft, despite being about digging for materials, crafting items, fighting monsters and exploring, but sure, I know what they mean. The key, fundamental difference between Minecraft and Terraria is simple: Minecraft is a creative exploration game, you dig and find materials, the purpose of which is to build grandly designed structures, mechanisms, and secret underwater bases (yes please). 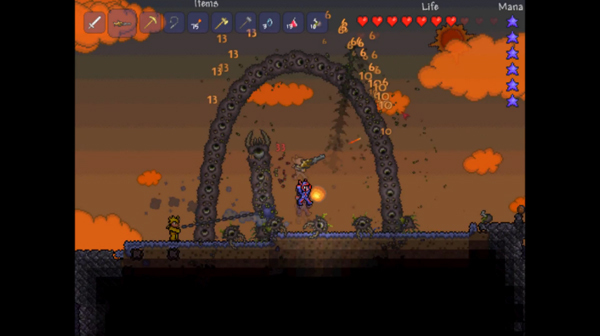 Terraria, however, is about the adventuring, the questing, and the looting, with a painfully cheerful injection of charm. It has more types of enemies than you can shake a lightsaber-style stick at, not to mention there are boss fights, and there are actually friendly NPCs that populate your world as you progress, offering you advice and items to help you on your quest for glory. I’ve only really scratched the surface of it so far, and have crafted myself a handful of cool items, but it’s not just about the swords, bows, pickaxes and hammers – it’s also guns, grappling hooks, anti-gravity boots, jet-packs, magic potions, invisibility spells, torches you can actually hold, helmets with headlamps, and a ton more awesome items that I still haven’t found or crafted yet. There’s even a currency in the game, in the classic form of bronze, silver, and gold. Gold! The sweet, delicious, hard-earned funding you killed dozens of evil creatures for, which you can give to the various in-game characters in exchange for the magical, mysterious, and downright must-have items that could help you smash that giant flying skeleton head into lots of little boney pieces. Yes. Adventuring is good. The character customization is significantly more entertaining and useful in comparison to that of Minecraft, allowing you the freedom to wear a great selection of silly or awesome things ranging from the most pointless vanity items, to the most useful armour made from Nightmare stone. Nightmare stone! Was there ever a stone you wanted more? I have to admit, I’m a little scared of it, and having to travel deep, deep, and deeper into the dreaded reaches of the earth to get your hands on the more valuable resources is even scarier. Every natural cavern and tunnel is rife with enemies, and if you aren’t being mauled by a giant man-eating worm that burrows directly into your face, or being hacked to pieces by a handful of skeleton warriors, you’d best be careful not to drop off a ledge to your untimely death, because seriously, you will lose a lot of coins. Standing at the precipice of a deadly chasm, shrouded in darkness, only to throw a torch into the abyss and watch the light slowly fall, and eventually disappear into nothingness, is truly a feeling that inspires a surprising amount of awe for a game that seems nothing more than a simple 2D Mario sandbox adventure – and yet somehow it is one of the greatest games I’ve played since Minecraft first came out. What’s that you say? Can you build a fort and hide out from all the flesh-eating zombies and multi-coloured jelly-beasts that want nothing more than to explode your frail human body into a gooey mess of bloody chunks and coins? Can you play with your friends? Can you each assign yourself to a team colour, turn PVP on, and have a good old multiplayer romp following all your own home-made rules? Yes to all of the above, and yes, you should pay the £5-6 for this fantastic game, right now. 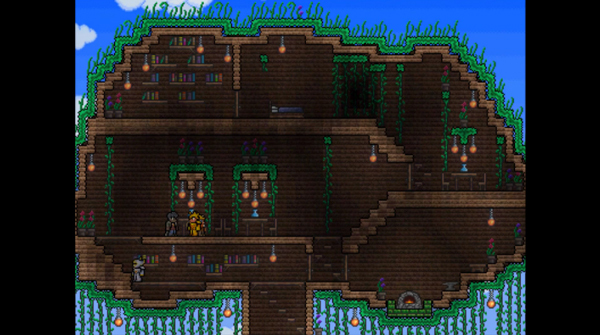 This entry was posted in Thoughts and tagged indie, re-logic, terraria. Bookmark the permalink.